From the pioneers in 4-stroke technology comes the BF250. It’s the result of 50 years of research and development, which has set new standards in the 250 horsepower class. Welcome to Honda’s wild side. The BF250 comes with our V6 engine coupled with Honda VTEC technology (Variable Valve Timing and Lift electronic Control), providing superb performance and fully optimised power delivery throughout the rev range. The High Output alternator delivers a solid 90A, which will keep a battery with a 60A charging capacity in top condition; and it’ll keep all your on board electronic equipment powered up too. 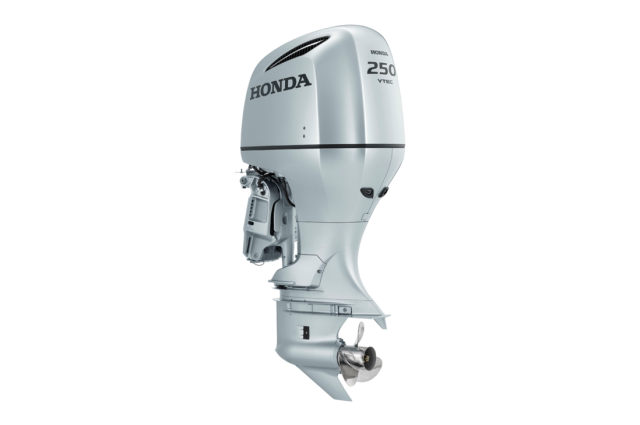 The BF250 is available with Honda’s exclusive iST Intelligent Shift & Throttle, giving effortless control of your outboard. It offers fine tuning of throttle settings at any speed, including a ‘slow’ mode for manoeuvring at low speed. Easy to install and simple to use, the iST provides complete control at your fingertips. The BF250 is without doubt the flagship model for more reasons than just horsepower. This incredible outboard provides a host of exclusive technologies that make it the best for both recreational and commercial use. NMEA 2000® compliant and featuring a host of racing innovations, the BF250 is a sleek and versatile motor that gives you exactly what you need, when you need it. Long-term reliability is important too, especially if you depend on the water to make a living. Remember, if your engine isn’t working – then neither are you. It’s never idle: Modern onboard electronic equipment needs a high level of electrical support. So we’ve built a high-output alternator into these engines, so you’ll never be short of power with the BF250. The slim and sleek hydrodynamic design isn’t just about good looks. 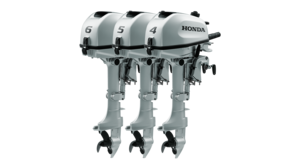 The Honda gear case efficiently transfers all that horsepower straight into the water. When you combine the innovative technology of the stronger transmission inside the motor with the low drag, you’ll find you’ve got a high-performing and economical engine to hang on the back of your boat. Geared for speed: The hydrodynamic gear case – slim for a big motor – has a super-low drag coefficient, and the gears within are machined and honed to ultra-fine tolerances. Working together, they reduce friction at high speed. It can haul heavy too: You’ll be very happy with improved fuel economy at any speed; and with a gear ratio of 2:1, it will push you along with ease. 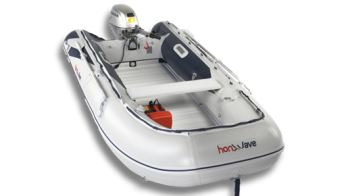 The BF250 is also very versatile, allowing you to attach a bigger 16-inch propeller for more thrust if you have a larger, heavier boat.